I read this article and found it very interesting, thought it might be something for you. The article is called Poor Clueless Officers and is located at https://archive.indiaspend.com/viznomics/poor-clueless-officers-2. 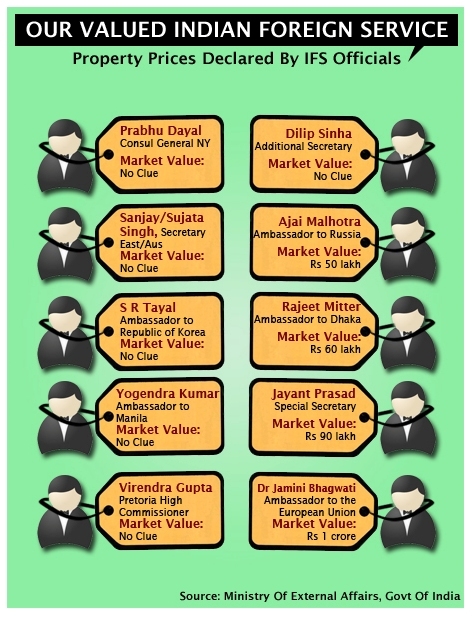 IndiaSpend decided to find out how a group of senior Indian Foreign Service (IFS) bureaucrats valued their apartments that they all bought in the same New Delhi Society in the late 80s. The IFS Apartments in question are at Mayur Vihar, Phase I, New Delhi. We went through the January 2011 filings of immovable properties of these IFS officials and found interesting results. This information is formally declared and it is available in the public domain. We don’t know what’s more worrying, the fact that these officers think that it’s such a pointless exercise that they wouldn’t have the time to establish the value of the apartments, or the deliberate intent to conceal the real value of the property because it might attract attention. Incidentally, the market value for IFS apartments as per our reckoning is upwards of Rs 1 crore so Dr Bhagwati is the closest in this sample. The rents declared are mostly in the Rs 240,000 to Rs 300,000 range for the same house, which seems close to reality. By the way, most of the same IFS officers also own apartments in a society in Sector 56, Gurgaon where again the value is either `not known’ or varies wildly.Please click here for the entire article.